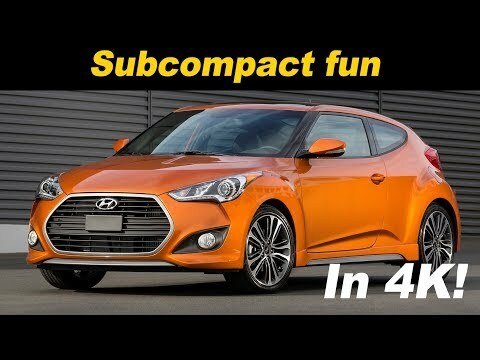 The 2017 Hyundai Veloster is a fun and funky sporty compact car with value pricing and a secretly practical side thanks to its sizable rear hatch and a hidden side door. In standard form, this 4-passenger car has only meager power, but a turbo model grants far more bite for not a lot more money. There is a 3rd door on the passenger side that people do not notice. The value package of this car is great. The car has terrible blind spots because of its design but the little extra mirror on the side mirror helps a ton with this. I love this car, it drives really smooth and it is easy to control. It is perfect for me because it is small. Features include sunroof, push button to start, apple and android carplay, car navigation and more. All of these things come in handy to enjoy my drives and contribute to being safer. The seats are comfortable and can be adjusted per person. I do wish they were leather and not fabric. I also wish the rear view camera had actual sensors to really gauge how close you are to something. It is hard to tell with the blind spots. I would definitely recommend the Hyundai Veloster. Not only do I enjoy its sporty hatchback style, but the features that it bring is what makes me love it. The carplay and back facing camera make it so easy to drive and navigate. As well as how it let's me know when I need an oil change since I am so bad at remembering that. The push to start feature and the ability to lock the car on the handles makes transitioning in and out of the car so seamless. The leather interior and the sunroof give the car extra glamour. And lastly, I love that it comes with the my Hyundai app that lets me lock it, turn it off, etc. from the app. Small, efficient, perfect for a millennial. No problems, it's a great car. The take off is great, it's easy to keep clean. Sunroof is huge and I keep it open all the time. Tires are small so when it comes time to get new ones it will likely be a bit costly. It is 3 doored which is cool so you don't have to slide up your seat to let people from the back out.